The Herbal Enzyme Syrup is known as the Flanzim Syrup and is basically an enzyme preparation that is aimed at improving digestion. 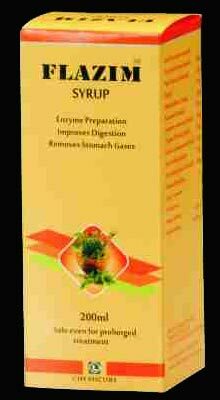 The Herbal Enzyme Syrup also removes stomach gases and is known for being highly effective. The company offers the best Herbal Enzyme Syrup at highly competitive prices. Kutaki : Bitter Tonic, Anti-bilious, Astringent & Stomachic. Vidang : Anthelmintic, Anti-flatulent, Laxative. Sanchal : Helpful in dyspepsia and abdominal disorders. Saunth : Aromatic, Carminative, Stimulant to Gastro Intestinal tract. Elaichi : Valuable in stomach complaints & carminative. Adult : 2 teaspoonfuls twice daily after meals. Children : Â½ to 1 teaspoonful twice daily after meals or as directed by the physician.